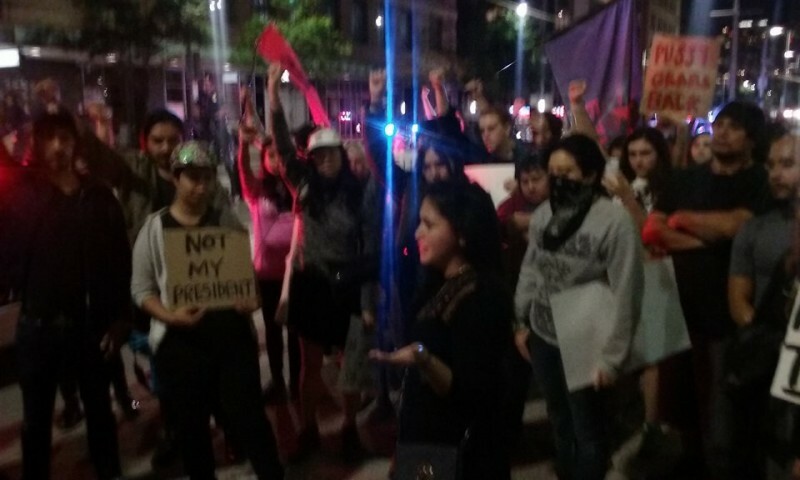 Hundreds protest against Trump in Houston, 5 jailed | Fight Back! Houston, TX - Hundreds of people, many who were students, came out to protest the election of Donald Trump, Nov. 10. They gathered in front of City Hall and began chanting, "Hey Trump, you liar, we're here to say you're fired," followed by a few speeches. The sentiment of the crowd was one of rage and anger. They began marching through downtown on Main Street where many people were out at bars. They chanted "Hey, hey, ho, ho, Donald Trump has got to go," which echoed loudly and could be heard everywhere on the street. They started marching in the streets and the cops became very aggressive. Dozens of cops on horses showed up and there was a brief confrontation with the police. Marchers were angered by the aggressive cops, and a protester made a brief speech saying, "These are Trump's minions who are taking away our democratic right to free speech!" During this confrontation, the cops arrested five people, three of whom were major organizers for this event as well as other events in recent weeks, like the protests against police brutality and racism. After this confrontation, the protesters marched to the police station and made some fiery speeches. Ashley Hall, a student at the University of Houston said of Trump, “His misogyny is going to take us back to the 50s and negate all the victories of the women's liberation movement. We don't recognize him as our president and refuse to let such a male chauvinist pig run our country." Lee Parker, a student at the University of Houston Downtown said, "We cannot allow Trump to turn back all of the victories of the Black Liberation Movement. He wants to take us back to the era of Jim Crow. He will put more cops in the streets, which will lead to more killings of Black people. Down with Donald Trump!" At the end of the rally, the protesters marched to the jailhouse to demand the release of all the activists who were arrested. Samuel Gutierrez, a student activist, said, "These cops have been put here by Trump to silence his opposition. They are trying to arrest the leadership of our movement in order to weaken the forces of resistance. We demand that all who were arrested tonight be freed immediately." The march was organized by Students for a Democratic Society and Black Lives Matter Houston. More protests against Trump are scheduled for this weekend.